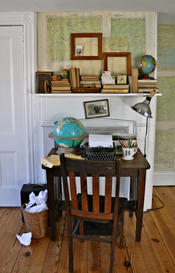 March 16, 2011 April 12, 2016 ~ Martha B.
I thought it would be a fun challenge to do a collection of posts on decorating. Not whole room renovations mind you, but rather smaller, more manageable projects. First up will be a bunch of ideas for decorating fireplace mantels. So…check back as I’ll be posting a new mantel arrangement each week. I hope these will provide lots of inspiration. 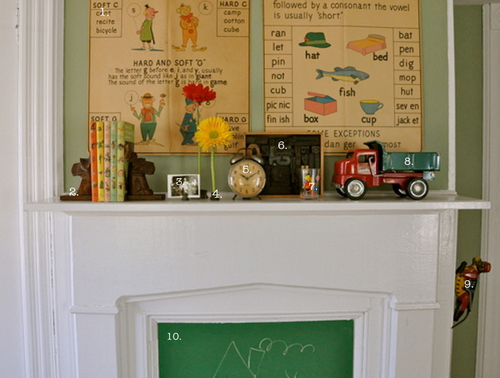 Two vintage school posters are the impetus for the playful decorating of this child’s bedroom fireplace. The mantel shelf can house a rotating display of toys, books & pictures. 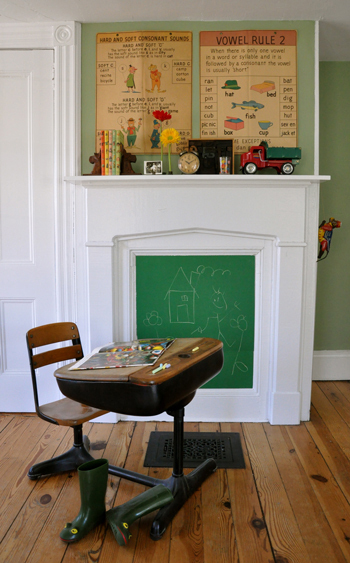 Chalkboard paint is my solution to what was once the opening of the fireplace. The old school desk was picked up at a sale for my son Curtis when he was three years old. Those are his rubber boots, too. Here’s a peek at next week’s mantel! Updated 4/2016- Vintage school posters can be found on etsy. Next > Hooray For The Underdog! Love the mantels! Look forward to seeing all of them. can you tell me where you got the vintage school posters? I am going to homeschool and i’m in the process of decorating the room and i think those (or something similar) would be adorable hanging on the walls! thank you! love this set up!